If y'all are anything like me, you love those "how it's made" shows. You know the kind: a massive warehouse full of heavy machinery and humanoid robots churning out 10 tons of Product X™ per second. As cool as those setups are...this is not gonna be that sort of blogpost. At Queen Charlotte's, we pride ourselves in the fact that every, single, detail of every, single tub is personally attended to by a tiny crew of Pimento Cheese fanatics. 1) we think it's the only way to ensure ours' is the best dang Pimento Cheese on the planet & 2) we're not smart enough to figure anything else out. In typical QCPCR-fashion, I've compiled an overly-verbose-yet-thouroughly-thorough glimpse at a "day in the life" of our little team. Hope y'all enjoy! I generally get to our incredible home base, Carolina Commercial Kitchen at anytime between 3:30 and 4:30 am (if you're not familiar with CCK, you ought to be; it's home to most of the best food trucks and independent food producers in the Charlotte-region. If it weren't for CCK, there'd be no QCPCR, nor would there be a whole lot of your other local favorites). It might sound crazy---because it IS---but we churn anywhere from one-half to one and a half TONS A WEEK out of an approximately 500 sq. foot corner of the kitchen. It's......kinda ridiculous. Our home base, Carolina Commercial Kitchen. (Pictured: Casa, Street Spice, Yummi Banh Mi, Papi Queso, and New Wrap Order Food Trucks). A few of our CCK pals (Sweet Girl Cookies, Fresh Med, and Papi Queso). It'd be a fools' errand to attempt to create the World's Finest Pimento Cheese™ while using anything less than the World's Finest Pimento Cheese Ingredients (patent pending). That's why every run of the Queen's Finest uses only REAL cheese. I know I shouldn't have to say that, but the next time y'all are shopping, check some competitors' labels. Some of the "cheese" y'all are eating...isn't cheese. No "pasteurized cheese products" or "imitation" anything, only the realest, fanciest-stuff we can find: extra sharp cheddar, sharp white cheddar, and pepper jack for our original and jalapeño flavors; blue cheese crumbles and smoked bacon cheddar for our blue and bacon flavors, respectively. 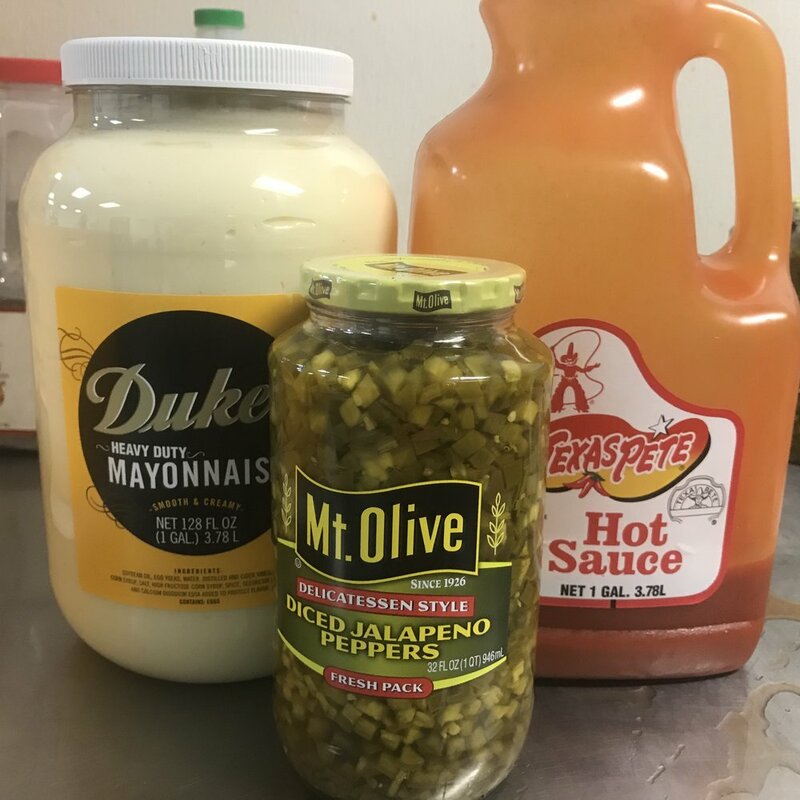 We EXCLUSIVELY use Carolinas-favorites like Duke's Mayonnaise (duh), Mt. Olive diced jalapeños, and Texas Pete Hot Sauce. We do everything in our power to price our cheese competitively; frankly, I'm pretty doggone proud of our price point. But if we're a buck more expensive than some of the other guys' stuff at your favorite grocer, I PROMISE y'all...there's a reason. Duke's, Mt. Olive, and Texas Pete...simply doesn't get any more Carolinian than that. Every run starts with our Duke's/cream cheese base---I call it the "sauce". We add some highly-classified herbs/potions/magic spells to the sauce, beat it to near-death in one of our two 30-quart Hobart mixers (the true work-horses of our operation), then we get to the fun part: SHREDDERATION. I know it sounds like a fairly esoteric detail, but I firmly believe it's a fundamental part of what makes QCPCR stand out. Doesn't matter if we're doing 100 or 2500 units, we hand shred our cheeses, 5 lbs. at a time. Again, this might seem like one of those things that should be a given, but if you really zero in on some of our competitors, you'll see that this process makes us the exception, rather than the rule. Don't get me wrong: preshredded-bag cheese (and all of the weird, modern science that enables it to stay so "fresh" in that bag) has it's place---impromptu taco night, any recipe you invent when you're eight, etc. But when it comes to creating the World's Finest Pimento Cheese™ (I feel like that tagline's gonna come up a lot...sorry), settling upon something somebody ran through the grater at the Topeka Kraft plant 3 months ago just ain't gonna cut it. Once the sauce is saucy enough and the cheese is shreddy enough, we mix them together, pour it all into a big ol' bin, and we toss it in the fridge to await packing. I know, I know...that's a pretty technical process I just outlined...SPEAK ENGLISH, QUEEN. The reality is, it's just that simple. If it tastes handmade and homemade, that's because the fact is: IT IS. Every tub of QCPCR is made with precisely the same level of technology and chemistry as grandma's was. The aforementioned "big ol' bin" of the World's Finest Pimento Cheese. Myers and I with the very first run of the Royale, February 28, 2014. Now's probably a good time to introduce y'all to our wacky little cast of characters. My then girlfriend (now wife/babymama) Myers and I started the company in early 2014. She wisely exited day-to-day operations about 20 minutes later to found Charlotte's Finest Salon (although she still rears her lovely lil' head when I beg and plead). These days, it's primarily me (John), my childhood best pal (Eric), my high school buddy (Marcus) and a dude who would've been our pal back then were he not so annoyingly spry and young (Vaughn). Marcus and I hand-make every, single tub. 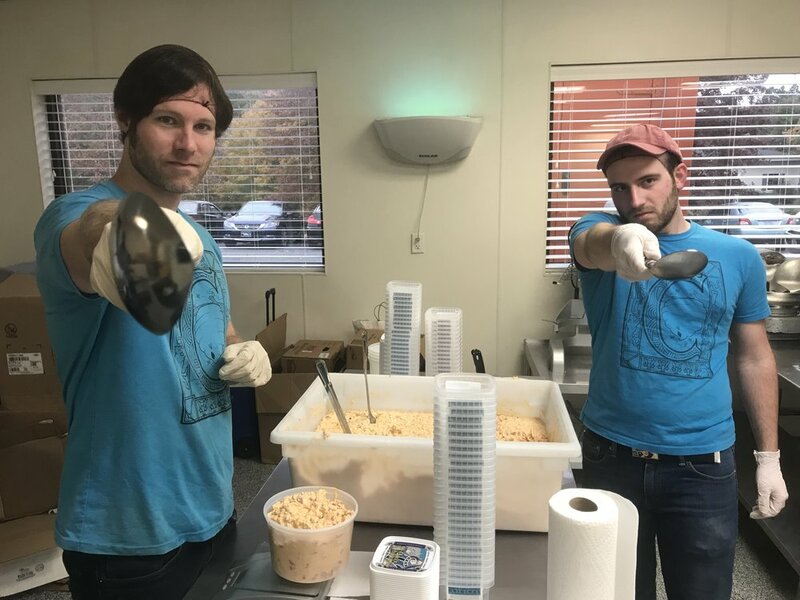 None of those humanoid robots from the first paragraph; just two old buddies from Union County churning out the a couple tons of the World's Finest Pimento Cheese™ a week. Marcus and I attempting our toughest cheese-snarls. Once we knock that part of the process out, Eric and Vaughn hand weigh, pack, and date every unit. Again...thousands upon thousands upon thousands of them. We pack 'em, stack 'em, and send 'em to the fridge. Like I keep saying: strikingly, beautifully simple. Eric and Vaughn displaying our cutting-edge packing technology. After we've cleaned our sprawling corner up for the day, the four of us divide and conquer the greater-Charlotte region (and beyond) by hand-delivering (or, in those 'beyond' cases, shipping) every single unit to the finest specialty markets/gourmet shops/restaurants you or anyone else has ever come across. 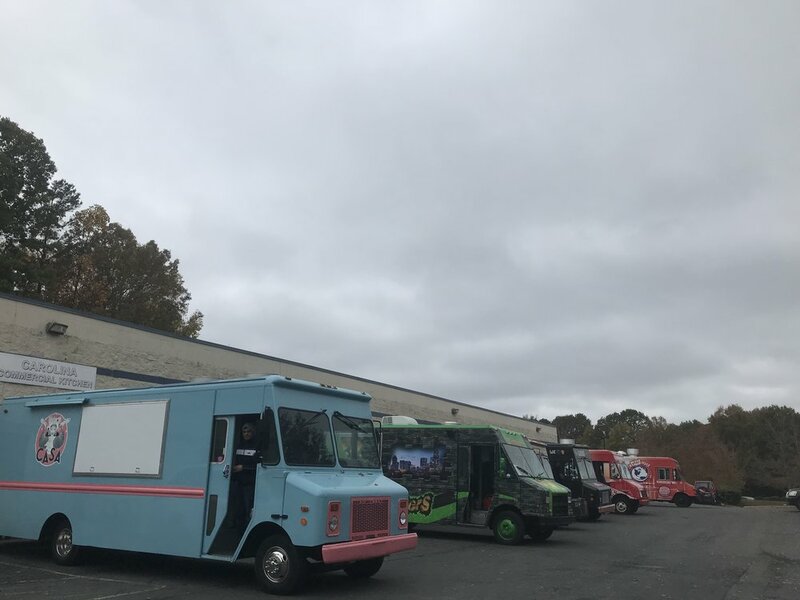 Recently, we've been fortunate enough to ink a deal with 142 regional Food Lion stores, so we rented our own refrigerated truck, bought some pallet wrap, and delivered 2,448 units to their doorstep. If you're starting to sense a theme developing, good on ya: this thing was a 110% American Dream/bootstrapped/D.I.Y. rig from day one, and it will be for as long as y'all pay us the honor of allowing us to keep truckin'. And that, as they say, is that. All that's left is the eatin'. I wish I could blow y'alls' mind with some mythical tale of the ancient alchemy that makes OUR Pimento Cheese reign supreme, but the fact is, it all comes down to some pretty boring, basic, principles. We believe that the best food ought to be made out of real stuff, by humans. We think that while adding weird chemicals and shelf-life extenders might benefit our short-term bottom line, folk who care about what they're consuming will reward us in the end (and again, we ain't smart enough to conjure up that sorta witchcraft anyways). We believe that quality will always trump quantity, and that when it comes to something like this, "compromise" might as well be a 4-letter-word. There're bigger, cheaper, longer-lasting brands (who doesn't want 4-month-old Pimento Cheese that SOMEHOW looks the same as the day they perfected it in the lab, right?!?) out there, but I feel confident in saying that there is NO fresher, NO more obsessed-over, and doggone it, NO BETTER Pimento Cheese on the planet than what you'll find inside of every tub of Queen Charlotte's Pimento Cheese Royale. The fact of the matter is, when it comes to Pimento Cheese: anything else is just a 'spread'. The week started off on a huge high when our spot at the 2015 Charlotte Southern Women’s Show was confirmed. The SWS attracts tens of thousands of attendees from all over the region, and the Royale was selected as THE pimento cheese to rep the the Queen City. Such an honor, such a joy. Now, to figure out how we’re gonna quadruple production; something tells me these ladies are gonna come hungry……. After months of blood, sweat, and tears, the fine folks at Old Town Public House swung the doors open this week, and we were lucky enough to be a part of things! OTPH is Cornelius’ newest (dare I say coolest?) relaxation destination; craft beer, wine, coffee, and naturally, the world’s finest pimento cheese. They’re carrying all 4 flavors, and if you act right, Melissa and Co. will probably even throw some free samples your way as you relax at the bar! Make haste to OTPH, LKN. I got a free shirt out of the gig, too!!! Tuesday was our lovely namesake’s 271st birthday! If you ask me, she doesn’t look a day over 245. Similar to the finely aged cheddar featured in our pimento cheese, Her Majesty just gets better with time. The Queen is bound and determined to bring poofy elbow frills back. The last entry into our “Month of Burgers” compilation dropped Friday, and it was…we’ll say “intense”. the “Baconham Palace Burger”: 2 diner-style 4 oz. patties, layered with the Queen’s smoked cheddar and bacon #‎PimentoCheese, and topped with Johnny Ray's Signature Sauces' (Mt. Holly) Peach Bourbon Sauce, Bone Suckin' Sauce's (Raleigh) Bone Suckin’ Sweet and Hot Mustard, homemade julienned pickles, caramelized onions, and two strips of sizzling #‎bacon. We piled it high on a buttered and toasted pretzel bun, and served it alongside the Queen’s “Mashed Tater Tots” (boiled fingerling potatoes we smashed, drizzled with olive oil and fresh herbs, and baked at 400 for a few minutes). Like I said: intense. We’re running a contest involving our burgers and free QCPCR swag later this week, so stay tuned for that!!! Saturday saw the opening of 1897 Market, Charlotte Douglas International Airport’s new gourmet eatery/specialty food market. It’s located just outside of Concourse A (where the Chili’s Too used to be), and they’re stocked to the brim with the Royale!!! (Since I’m telling you about it, you’ve probably surmised that, but I just wanted to be clear.) The next time the stress of air travel has you dragging and drained, decompress and reinvigorate with a tub of the Royale!!! You’ll be flying high in no time. Hope all of y’all have a wonderful Memorial Day weekend filled with fun, food, family, and fellowship. Have a ball, wave those stars and stripes, and most importantly, stay safe. Until next time, everybody!!! We had an absolute BLAST at Moo and Brew Fest April 11th. I know I hyped it up beforehand, but I’m telling y’all, it was just a perfect day at the NC Music Factory. Beautiful weather, beautiful people, killer tunes, yummy suds and bodacious burgers. There are already rumblings about next year’s throwdown; y’all need to make sure you don’t miss out!!! Rhonda, Eric, Myself, and Prince Henry enjoying Moo and Brew 2015. While we’re on the subject of “delicious grilled meats”, the “Royale with Cheese” (our “Black and Bleu Blood” blue cheese pimento cheese, grilled onions, and dijon mustard pilled atop a housemade andouille sausage) is absolutely KILLING it at J.J.’s Red Hots!!! Jon and the gang at J.J.’s order more and more of the stuff every week, and the Queen couldn’t be happier. Y’all keep woofin’ down dogs, and we’ll keep supplying the cheesy goodness!!! One of the major things I wanted to make sure to cover in this week’s blog is the fact that we’ve added 4 new vendors/restaurants, 3 of which are in towns that’re brand new to the Queen! That’s right: you can now find the Queen’s finest on the shelves of the Market on Wylie (Lake Wylie, SC), the String Bean (Belmont, NC), Pam’s Cafe at Blacklion (Pineville, NC) and on the menu at Vintner Market (Arboretum, Charlotte)! In addition to our seasonal retailers reopening for this beautiful Spring (Providence Produce Markets and Josh’s Farmers Market are killing us…in the best possible way), these 4 new kids on the block have kept us as busy as can be. Seriously, y’all: take a look at our Where to Buy and Restaurants pages. Simply put, we’re working with the very best of the very best, and we couldn’t be any happier to have our new pals on board the Cheese Train! USA Love List, a website dedicated to finding the best American-made products and telling the world about them named the Queen’s “Pimento Cheese Royale” their “favorite original pimento spread in America” last week. No biggie; here’s the article. Oh, and one last thing. As any of you who follow our Facebook page/Instagram account (@QCCheeseRoyale) know, we’re in the middle of our “Month of Burgers”, during which we’re using each of our 4 flavors to create a signature burger for each week. I’ll spare y’all the details (check our Facebook page for all of the ingredients on all of the burgers), but yeah…this thing has gotten pretty intense. We’ll be finishing things off this Friday with our BACON burger (y’all, it’s a monstrosity), and then I’m thinking about doing a little giveaway to finish off this gorgeous May, so stay tuned!!! The Queen's Quill, 04.05.15.: IN LIKE A LION!!! I missed the blog last week, and I’m a day late this week. But I swear it…I have an excuse: IT’S Y’ALL’S FAULT!!! And I mean that in the best possible way. Spring 2015: Sheer, shrieking, TERROR. You see, each and every one of our amazing seasonal retailers have swung their doors open for the 2015 season over the past 2 weeks, and you beautiful people responded incredibly! That’s right, Providence Produce Market’s 4 locations (Ballantyne, Mint Hill, Stallings and Waxhaw) and Josh’s Farmers Market (Mooresville) all came out of the gate swinging, and y’all responded by buying up every ounce of the Queen’s Cheese we could get in stock. It’s been an exhausting, wacky, exhilarating time period, and I just can’t thank y’all enough. We’ve really hit our stride over the past few weeks, and we owe it all to you guys. Thank you. Simply amazing. 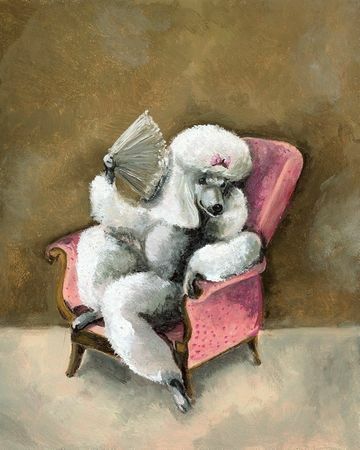 Now we transition from terrifying jungle cats to deliciously domesticated dogs. After weeks of teasing, our collaboration(s) (that’s right…there are 2 of ‘em!) with J.J.’s Red Hots are officially LIVE! First off, we have the “Royale with Cheese” which features a house smoked andouille sausage, caramelized onions, whole grain Dijon mustard, and our "Black and Bleu Blood" Blue Cheese Pimento Cheese, all atop a toasted bun. Yep. Serious, serious business. Put it all together and you get J.J.'s first "Barn to Bun" dog, in which local ingredients (in addition to our presence, the pork comes from NC's own Windy Hill Farm!) combine to form a truly "local" creation. So. Much. PERFECTION. For dog #2, J.J.’s has teamed us up with Triple C Brewing Company for their latest “‎Brew Dog” offering, in which local craft breweries match their wares with J.J.’s killer links. The "You Got Smoked" dog combines a ‎Triple C Smoked Amber-marinated smokehouse hot dog, Triple C Smoked Amber and Guajillo Chile BBQ sauce, fried jalapeños, and a healthy dollop of the Queen's "Baconham Palace" smoked cheddar and bacon Pimento Cheese to create the most decadent dog this side of Louis XIV's poodle. It's available starting TODAY (05.06), and it runs throughout the week. Y'all best come early and come often; when they're gone, they're gone!!! We’ve covered ferocious lions, demon dogs…it’s only right that we finish things off by grabbing the bull by the horns and talking about Creative Loafing's Moo and Brew Festival!!! That’s right: M&B is mere days away, and if you haven’t snagged your tickets, I’m telling y’all…you just gotta. VIP tix are sold out, but a limited amount of General Admission spots are still available, so hustle! In addition to helping sponsor the event, we’re also teaming up with Mattie’s Diner to compete for the title of “Charlotte’s Best Burger”, so we need all of y’all out there throwing your weight behind us! Hope to see each and every one of your smiling faces there. Until next time, everybody!!! Wednesday was just about the only “interesting” day we had all of last week, but man, was it ever a big one. I started out the day by dropping off all four flavors of the Queen’s finest to Chris MacClain, Jim Celania, and Travis “T-Bone” Hancock at WFNZ (610 AM). The fellas (better known as “The Mac Attack”) immediately started devouring the feast, and took to the airwaves to tell their audience all about it it. So that was pretty flippin’ cool. After that, I bolted over to Mattie’s Diner at the NC Music Factory, where we shot a live spot in promotion of our spot at April 11th’s “Moo and Brew Fest”. Here’s a link of the piece; I come in at around 2:20. Wilson and the WCCB crew were as amazing as ever, and I have to say, I CANNOT WAIT for Moo and Brew. If y’all haven’t already, get your tickets ASAP. It’s going to be an incredible day all around. Maybe the most exciting thing to come out of Wednesday’s escapades was a connection we made at Mattie’s. Matt dug into our cheese as soon as we got there, and he was immediately smitten. The result: we’re partnering with Mattie’s on a burger to be featured at Moo and Brew, as well as an item to be featured on their permanent menu! I dropped off their first “test” tubs Friday, and I’ll let y’all know when we have some more specifics hashed out!! !